Just more than three and a half-hours' drive from Cape Town, the Tankwa Karoo National Park is surely one of the most unique and unusual destinations in South Africa. Situated within the confines of the Succulent Karoo, the Park is approximately 150 000 hectares in extent and is bounded by the steep slopes of the Roggeveld Mountains to the east and the R355 in the west which links Karoo Poort and Ceres with Calvinia. The Park straddles the border between the Northern and Western Cape and is drained by the Renoster and Tankwa Rivers. The Park is still under development, yet offers the visitor some of the most unique and surreal experiences of any National Park in South Africa. Tankwa Karoo is the type of National Park that appeals to the connoisseur of wide open spaces, peace and solitude and offers spectacular landscapes across the lunar-like Tankwa Plains to the distant ramparts of the rugged Roggeveld Mountains. The Park’s unique fauna and flora offer glimpses of tiny jewel-like flowers on a crisp Spring morning, to the sun-baked vista of blue sky and the grey-green landscape mantled in low scrub, succulents and copses of acacia. Gemsbok, kudu, eland, red hartebeest and Cape Mountain Zebra are some of the larger mammal species to be found together with duiker, steenbok and springbok. Nocturnal species include leopard, porcupine and black-backed jackal. The Park is also a bird watchers' paradise with the most sought-after species, Burchell’s Courser, occasionally sighted on the rough grey gravel plains. The stately Ludwig’s Bustard and the Karoo Korhaan are relatively common sightings. During the spring months the dry plains burst into life with the blooming of millions of wild flowers after the advent of the first spring rains, which transforms the barren plains and hillsides into colourful landscapes of yellow and purple. The park protects one of the most beautiful tracts of the Tankwa Karoo and is situated within the Succulent Karoo Biome with approximately 600 plant species identified within the Park. The Succulent Karoo boasts the world’s richest succulent flora, as well as high reptile and invertebrate diversity. There is a network of basic vehicle tracks which provides easy access to most areas, with high clearance vehicles recommended for the scenic Gannaga Pass linking the Park to the hamlet of Middelpos on the Roggeveld Plateau. 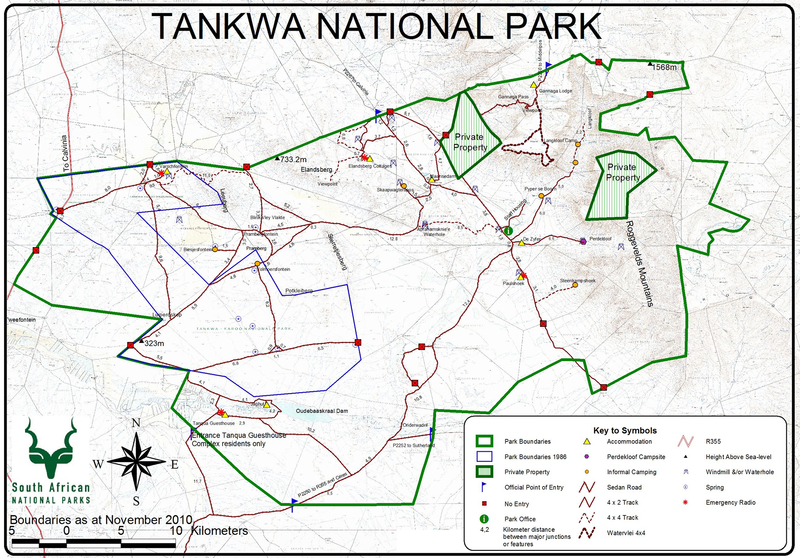 A detailed map of the reserve can be downloaded here. The Park is also serviced by a variety of accommodation options ranging from basic campsites, to comfortable cottages and luxury lodges and guest houses. A detailed brochure listing the accommodation options can be downloaded here. The Tankwa Karoo National Park is must-do for everyone who loves the special ambience and atmosphere of the Karoo. The spectacular landscapes, the abundance of space and solitude, the ever-present sunshine and the chance encounters with rare species of plants, birds and animals will provide memorable experiences and an opportunity to relax and enjoy this very special place.